What do I need to bring when I come for my pick-up? Saturday: 10 am – 2 pm. When you register, you choose one of these days. On your pick-up day, you are welcome to arrive before the barn opens to enjoy the farm or start doing your u-pick. Because we harvest and clean produce right up till we open the barn doors, though, we can’t open early. Once I’ve chosen a day, can I switch to another day? Once you’ve chosen a pick-up day, we ask that you stick to your scheduled pick-up day. We harvest produce in the morning and need to know how many shares to harvest. If you find your original choice to be inconvenient, we will happily allow a change for the remainder of the season. By and large, we cannot support random changes week to week. We do understand that things come up and switches are inevitable, but it’s very helpful for our staff if switches are kept to a minimum. Please email us no later than noon on Monday of your desire to change pick up days – we organize our harvest list on Mondays and want the lists to be as accurate as possible. What if I can’t make it by closing time on my pick-up day? This happens from time to time. If you’re rushing trying to get here but think you won’t make it, please email us or call as soon as possible before the end of the pickup hours. We can either reschedule your pick-up day or will pack a box for you, label it, and put it on the porch for you to pick up after hours. We’ll also leave the u-pick board out so you’ll know what and how much to harvest. What if, for unforeseen reasons, I find I just can’t get to the farm on my pick-up day? On the rare occasion that events outside your control prevent you from sticking to your well laid plans, please email to schedule a different pick-up day for that week. Hopefully these changes are few and far between, but when needed, we understand. This is an area we don’t wish to police; you must monitor yourself. We harvest based on the number of members scheduled to pick up and need to keep this count close, so your call is important. What if I know in advance I will be out of town on my pick-up day? Can I get the produce later or have my cost pro-rated? If you are going to miss a pick-up, you are free to have a friend, neighbor, or relative pick up your share for you. You’d be surprised how ingratiating this can be! Just have whoever is picking up for you tell whomever is in the market that they are picking up for you. We’ll help them through the pick-up process. You may also request, as many members do, that we donate your share to the local food bank. We work with the Carnation branch of Hopelink, and we have been donating unused shares as well as excess harvest to the food bank for years. They are very appreciative of the contributions! Please email by noon on Monday if you’ll be donating your share, as that gives us time to organize and transport your donation. Can I substitute something I don’t like for something I do? No, you cannot substitute. But you are not required to take anything you don’t want or care for! The produce we provide is often more than most members can use. Many of our members tell us they feel they can choose what they want from what is offered and still get all they need. We take that into account in our planning. Are the weekly shares of equal volume (and value) each of the 20 weeks? No. The season starts slowly, with a small volume of mostly green vegetables for the first couple of weeks. There is also very little (if any) u-pick for the first couple of weeks. Then things begin to change rapidly, and by July, the boxes have increased in size. August, September and October find us in the peak of production, with larger quantities and greater varieties of produce, fruit, and flowers. 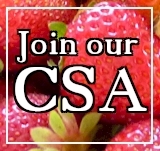 The financial “value” of the membership (setting aside the important issues of supporting local, organic agriculture) must be assessed in the overall season, not any single week. Are other items available in the market? What items are available for u-pick during various parts of the season? Flowers are available throughout almost the entire season. Peas in the spring. Strawberries are ripe early and again on and off throughout the season. Beans, edamame, cherry tomatoes, dill, cilantro, and basil can all be picked during the middle of the session. Later we have fall raspberries. Parsley, cutting celery, chives, sorrel, borage, and nasturtiums can be harvested in small quantities most weeks. How do I find u-pick items? You can always ask whomever is working in the market. We mark u-pick items in the field with blue barrels at the beginning of the u-pick rows. We also will provide a map of the location of all u-pick items. How much can I take when u-picking? Available produce and quantities are posted on the u-pick list located in the barn (and on the barn porch). Please remember that if something is not on the list, that means that it is unavailable to everyone, and you may not harvest it. “Take a specific amount”: Often we use our produce bags as a measurement for quantifying the u-pick. For example, if we say one bag, we mean one of the produce bags you find throughout our market. “One bag” does not mean a 50 gallon garbage bag you bring from home! We mean one of the produce bags from our market. If we say “half-a-bag,” you just have to estimate when you’re bag is half full. Remember that you don’t “have” to take it all if you can’t use it, but please never take more than your share. If the u-pick board gives a weight, for example “one pound” or “half-a-pound,” we’ll have a scale on the blue barrel at the beginning of the u-pick row. Yes, children can u-pick! This is one of the important and valuable activities of the farm. We do ask, however, that children u-pick only under an adult’s supervision. We are very aware that with children “helping” in the fields, there will be some damage. We can live with this, as long as it is a learning experience. 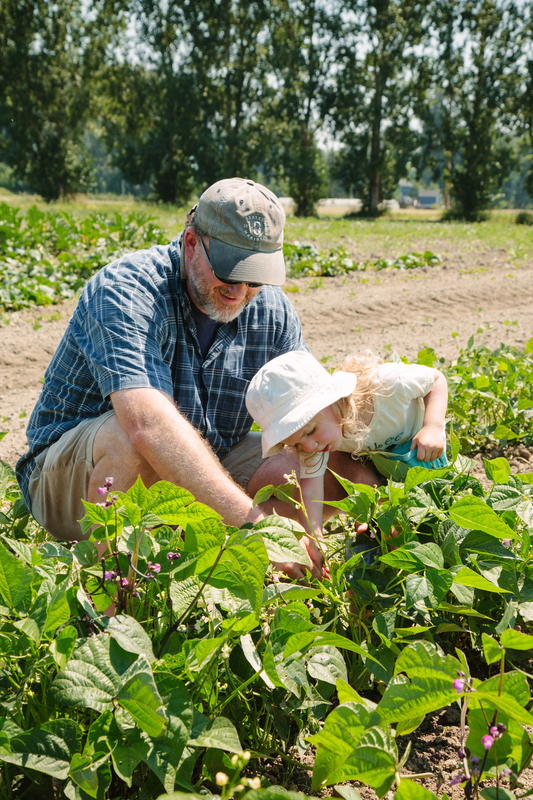 A parent harvesting and teaching his or her child to harvest is an experience well worth the risk of damaged plants, and if under your supervision your child injures a plant you ought not feel bad about it—that’s part of the learning. We only ask that children harvesting have that parent with them! What should I do if I witness “u-pick abuse”? If you feel strongly that you are witnessing someone abusing our u-pick policies, the best thing to do is to politely ask if they have read this guideline about u-pick. There is probably some kind of misunderstanding, or they are members who do pick-ups for neighborhood groups. If the misunderstanding can’t be resolved, please contact one of the farm workers and we’ll take it from there. We don’t want to be “veggie police,” or make anyone else to feel that they have to enforce rules. But we are a community, and we can’t be blind to abuse. If it is occurring, please let us know immediately so we can maintain fairness between our members. Can I u-pick on the weekend or some other day (besides my pick-up day)? Yes, you can u-pick on other days. We understand that some members like to come as a family for their u-pick, and that in some situations that can’t happen on pick-up days. On days when we are not open for CSA pick-ups (Sundays, Mondays, Wednesdays, & Thursdays), you will be on your own, but we will have the u-pick board posted – as well as bags & pints on the porch – so that you’ll know what is available. Yes! We are not able to include all u-pick items in your delivery box, since not all of them travel well (flowers, etc. ), and the harvesting of many of them for a large group can be a big time commitment (strawberries, etc.). We do, however, include certain u-pick items in delivery boxes – green beans, grapes, herbs, and more. We consider our u-pick selections to be a “bonus” – i.e., u-pick is not calculated into the cost of your shares. As a delivery member, although you are not receiving the full u-pick selection every week, you are not being shorted on the value of your box. As a delivery member, can I still come to the farm to do u-pick? Absolutely! You are welcome to come any day of the week to do u-pick. If you’d like to do u-pick and pick up your box simultaneously, rather than having it delivered, you’ll need to come during open hours (Tuesdays & Fridays from noon – 6 pm, Saturdays from 10 am – 2 pm). If you will be coming to do u-pick but still intend to have your box delivered to your depot that week, please email us by noon on Monday of the week you wish to come – that way, we can leave u-pick out of your box that week, since you’ll be picking it up at the farm. Can I bring a lunch or dinner to eat at the farm? 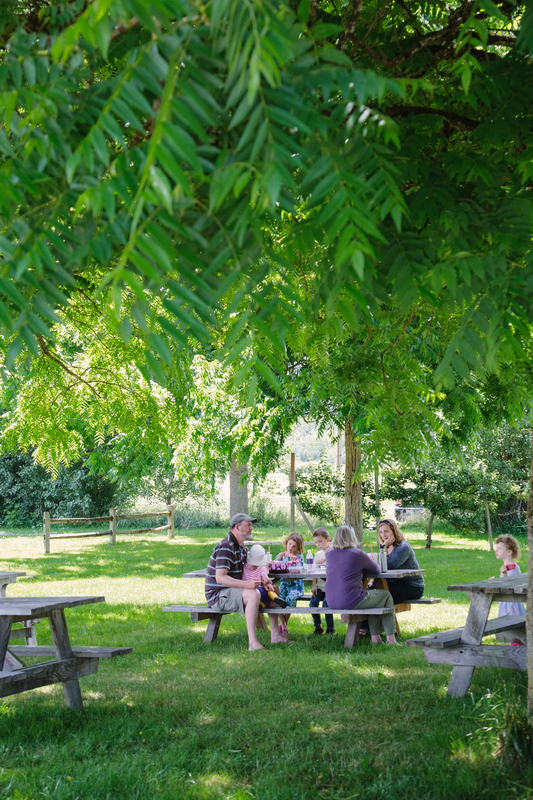 Yes, we welcome people to come and have meals at the farm! We ask that you clean up after yourselves and keep track of your kids. Can I bring guests to the farm? Yes, of course. We’re always happy to see members bring friends and visiting family members. Please feel free to do that! Could I use the farm for a work/school/church function? The answer to this question is “yes.” Our farm is always open for members to visit, and bringing groups is almost never a problem for us. If the groups are large, and if your function would require special use of our facilities, there will be a charge. It is best to let us know in advance about the group function you have in mind. If you have guests who can’t come with you on your pick-up day, you are certainly welcome to come by to show them the farm at any time. Can kids come to the farm? Yes, children are welcome! We do ask that parents keep track of their kids while on the farm. It’s tempting to just let them run, but unfortunately, there are no truly safe “sanctuaries” anymore; we all need to know where our kids are at all times. We have both an inviting, but dangerous, river, as well as a busy county road which run through the farm. Farm equipment also poses a danger. Parents need to be vigilant. Can I go swimming at the farm? No, you can’t. The Snoqualmie River is more visible now that we are in a riparian restoration project. That “visibility” will continue until the native trees and plants form a hedge. Everyone needs to know the river is deep, swift, and potentially dangerous. Our insurance does not allow us to have members swim in the river. Sorry. King County maintains the Tolt MacDonald Park in Carnation that offers swimming access to the river. It is only minutes from the farm and is a beautiful place to visit and swim. Can pets come to the farm? We have chickens, ducks, pigs, cows, and various other animals here at the farm. Pets of any kind (especially dogs), leashed or not, can cause a lot of problems for domesticated livestock. We also know that although most pet owners are considerate and clean up after their pets, some do not. We have had the unpleasant task of doing the “clean-up”. We’re sure there are issues we haven’t addressed. Please contact us with any other questions!